18-year-old daughter of Johnny Depp and Vanessa Paradis Lily-Depp Depp between filming in the movies and fashionable events does not forget about the fact that she is a teenager. 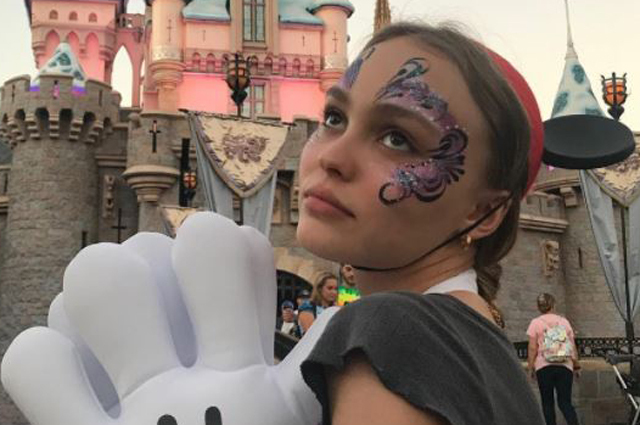 The other day the girl shared on her Instagram picture taken during her stay at Disneyland, where she went along with her 26-year-old boyfriend Ash Stymest. 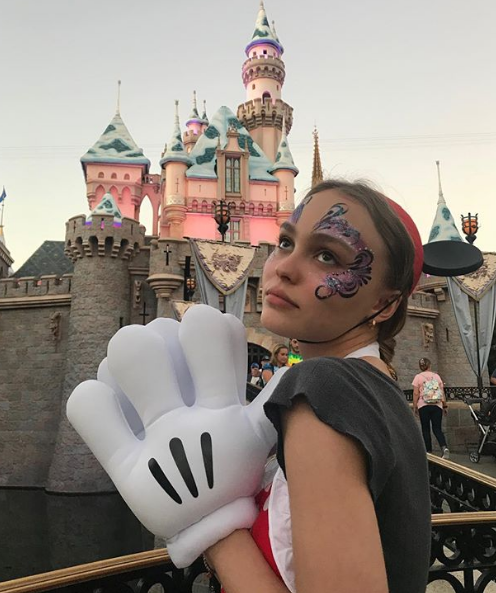 In the photo, shared to Instagram, the actress is seen with the face painted with flowers, and Mickey Mouse's gloves. Happy moments of their leisure young model and Ash recorded on the video, which was shared in the stories of Instagram. Lily-Rose Depp rarely tells how she spends time. Mostly for her it is done by the paparazzi, exposing the pictures of the girl in different editions. But this time Lily-Rose outstripped secular photographers. Recall that Lily-Rose is the face of the French Fashion House Chanel and the muse of Karl Lagerfeld. This week, she visited WWD Honors in New York, where the maestro received the award. 18-year-old Lily-Rose posed in a black dress with a multi-tiered skirt. For the event, the daughter of Johnny Depp and Vanessa Paradis made a low-key make-up with an emphasis on the eyes and radiant skin. Lily Rose opted for a tall tail and complemented her laconic image with large earrings. In July, the House of Chanel published a new survey, the author and photographer of which was traditionally Karl Lagerfeld. This time he photographed two young muses of the French brand - 24-year-old Cara Delevingne and 18-year-old Lily-Rose Depp. Girls created futuristic images looking like a space travelers, exploring the furthest corners of the universe. Depp put on a tweed jacket decorated with crystals - the favorite thing of the wardrobe from Chanel. Also, the girls took off in embrace, trying on hoodies with a space print. In addition, Depp's daughter followed in the footsteps of her parents and is actively doing movies. In the near future, the movie "Moose Jaws", where the actress performed along with her father, will be released. Details of the plot are not disclosed, but it is already known that this will be a horror film. And the role of a frightening mystical force will come out ... moose.